Samsung Galaxy J6 has a starting price of 13,990. This is the cheapest Samsung phone to come up with Super Amoled Infinity Displays. the Indian smartphone market spoke Samsung's stock, especially in entry level and mid-range smartphone segments. But now the company's grip is not the same. The reason for this is the affordable handset brand of brands such as Chaomi and Asus. The South Korean company has now unveiled the new Samsung Galaxy J6 handset, which is the company's new offering for the Budget Segment customers. It is the cheapest smartphone to come up with Samsung's special 18.5: 9 aspect ratio with Infinity Display. Many specifications of the new phone of the smartphone and the UI features match the handset of the Samsung J series and on series. But some new experiments have been made about the design. The initial price of Samsung Galaxy J6 is Rs 13,990. Will Samsung's phone be able to challenge the Redmi Note 5 Pro and ZenFone Max Pro M1 on these features and specifications? Through the review, we will try to find an answer to this question. The design of Samsung Galaxy J6 is refreshing. Due to the long display and sleek frame, it is convenient to keep it in the hands. Its thickness is 8.2 millimeters. We did the same thing in First Impression that finger prints on the rear panel are not easily available. This phone has been used in the front of the Samsung's 2.5 D Curved Glass. It has an infinite display with an 18.5: 9 aspect ratios. Samsung has given its own 5.45-inch Super Amoled Panel with HD + (720x1480 pixels) resolution. Colored crisps and steaks come due to amoled display. Black is quite deep Brightness is quite good. But the resolution slightly disappoints. There are some drawbacks too. Samsung has adopted its old strategy with this phone too. Ambient Light Sensor is not used in the Galaxy J6. Because of this, the phone does not have the Auto Brightness Adjustment Toggle. During the review, it was difficult for us to manually manage the brightness level. The display has an 8 megapixel selfie camera, selfie light and earpiece. For the first time in a Samsung Galaxy J series phone, there are no physical buttons under the display. This time the Home, Back and Overview buttons are on screen. There is a power button on the right edge of the phone and the space has also been made for the speaker. There are buttons for the volume control on the left. There are two separate slots. SIM card can be placed in one. On the other hand, there is a space for the MicroSD card with a SIM card in the other. Both the slots have to use the Nano SIM, but at any one time SIM will only work on the 4G network. In the lower part, Micro-USB port, microphone and 3.5mm headphone jack have been replaced. Within the retail box is a power adapter, USB cable, SIM ejector tool and a wired headset and quick start guide. Galaxy J6 speeds up the Acinos 7870 processor, which is the most disappointing aspect of the phone. For the past two years, chipsets of the Acinos 7 Series are part of Samsung's budget phone. Now the company needs to change it. We have reviewed this phone's 3GB RAM and 32GB storage variants. But the company has also launched Samsung Galaxy J6's 4 GB RAM and 64 GB RAM storage variant. But the variant of more RAM is not yet being sold in India. The connectivity feature includes 4G VoLTE. Wi-Fi, Bluetooth 4.2, GPS, 3.5mm headphone socket and FM radio are also present in the phone. But there is no support for NFC. There is also a choice of Wi-Fi calling. Like the old Galaxy of Galaxy J and Galaxy On series, Samsung has not given some important sensors in this phone too. The phone only has proximity sensor and accelerometer. Ambient light sensor or gyroscope will not be found. Talking about the software, the Samsung Galaxy J6 handset runs on Android 8.0 Orao based Samsung Experience 9.0. This OS has been part of the company's premium handset. The date of the Android Security Level Patch in the phone is 1 April 2018. The default weather on the Home screen and the time widget at the top. Apart from this, there are shortcuts for Google and Microsoft's apps with the Google Search bar. On the left side, the Bixby home screen will be exposed on swipe. Samsung has given Samsung Magazine's Image Recognition based shopping app Samsung Jelly in Galaxy J6. It was introduced with the Galaxy on 7 Prime. Samsung Mall has now been much better than identifying gadgets and clothing. There's also Samsung Pay Mini. Samsung brand video and music app are not pre-installed in the phone. If you wish, you can download them from Samsung's My Galaxy App Store. Chat over video is a work feature. is. With this help, users will now be able to reply to WhatsApp and SMS messages while watching fullscreen video. There is a dual messenger mode for social media apps such as Facebook and WhatsApp. Panic mode is there. Users can browse notifications with fingerprint sensor. We've reviewed 3GB RAM variants. Except for a few occasions, we never felt the need for RAM. However, what will be the performance when it's outdated? This will be a thing to see. Animations and transitions in the Galaxy J6 are limited. The Bixby home screen often runs intermittently. Probably because of such a lot of content. There is no digital compass or gyroscope, so Google Maps can not even tell which direction you are looking at. Casual games such as Subway Surfers and Temple Run 2 were easily played on the phone, along with powerful graphics graphics such as Asphalt 8 did not have any problem in playing. While playing the game, the battery consumption was not too much. The company has fiercely promoted about Galaxy J6's Face Unlock feature. This works fine in daylight. But at night it is not of any use at most occasions. Good thing is that fingerprint sensor is available. During the review we found that it was working fast. Benchmark scores were below average. It has not been able to challenge Redmi Note 5 Pro and ZenFone Max Pro M1 from anywhere, while the price of these handsets is only around the Galaxy J6. The Galaxy J6 has a 13-megapixel camera on the rear side. This camera has also been used in Galaxy On7 Prime too. Its aperture is f / 1.9 and it comes with LED flash. Daylight or low light, pictures taken from the camera come frustrating. Blue color reproduction is clearly visible on super amoled panels. It also has HDR mode but you will not get much help. In the camera app, you will find modes like Beauty, Night, Pro and Panorama, which do not make big improvements in quality of pictures. The front camera sensor is of 8 megapixels. It also comes with F / 1.9 aperture and LED Selfie Light. Selfie taken in daylight is good, but the performance of self camera in low light is very poor. There are also 3D stickers in the camera app for social media enthusiasts. There are video shakey records due to lack of electronic image stabilization or optical image stabilization. You will be able to record videos of up to 1080 pixel resolution. Samsung is also promoting its Galaxy J6 with battery life. Even though the battery of 3000 mAh battery may not be too large, the standby time of this phone is appreciable. 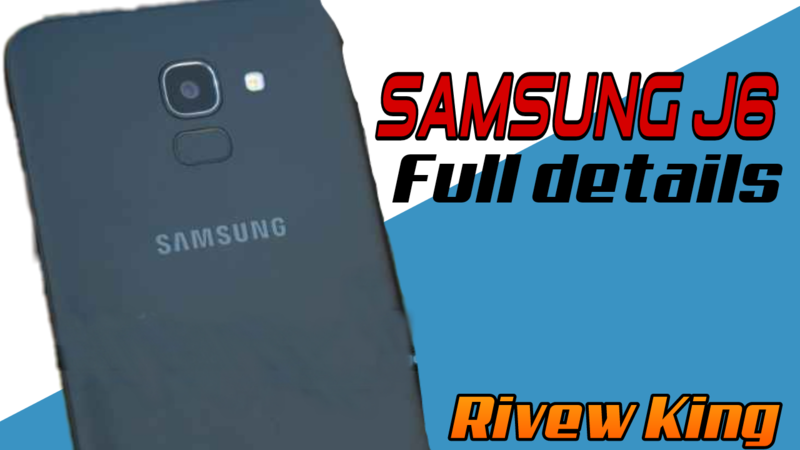 Samsung Galaxy J6 has been in our HD Video Battery Loop Test for about 14 hours and 10 minutes. In this department, Asus Zenfone maximizes Max Pro M1 and gives the performance of Radmi Note 5 Pro level. During common use, we needed charger only once a day. Charging with the phone takes about two and a half hours to fully charge the phone, making many people frustrated. Samsung Galaxy J6 is not a money-backed product compared to Xiaomi Redmi Note 5 Pro and Asus ZenFone Max Pro M1. Snapdragon is a more powerful processor between the Acinos 7870 and Qualcomm Snapdragon 636 processors. The initial price of the Galaxy J6 is 13,990. There will be 3 GB RAM and 32 GB storage at this price. At the same time, the price of 6 GB RAM and 64 GB storage variant is 16,490 rupees. Slow charging and average cameras weaken the phone's claim. But the most frustrating ambient light sensor, digital compass and fast charging are not necessarily about giving the feature. However, due to the new design, dependable battery and super amoled display, Samsung's mid-range handset will not be lost in the crowd. Altogether, there is some appeal in this handset, initially priced at Rs 13,990. And it will not be out of stock like its rivals.